Can Somebody Get Melania Trump and Her Pith Helmet Out of Africa? Send Help: Can Somebody Get Melania Trump and Her Pith Helmet Out of Africa? 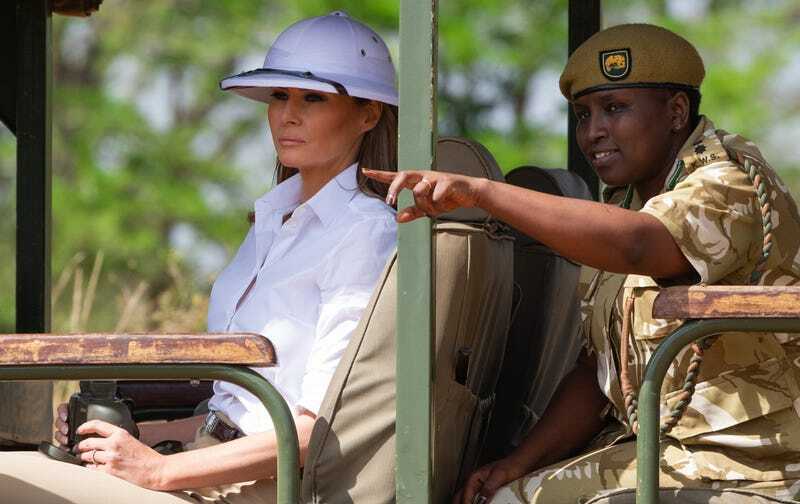 Melania Trump goes on a safari with Nelly Palmeris (R), Park Manager at the Nairobi National Park in Nairobi, October 5, 2018, during the third leg of her solo tour of Africa. Could someone please tell Melania Trump that she is not Meryl Streep in Out of Africa, is not modeling for an old-school Banana Republic campaign, has no hopes of being rescued from her misery by Indiana Jones and can therefore chill with the “safari chic”? Further proving her mental disconnect from what her insufferable husband charmingly referred to as “shithole countries,” Melania has seemingly opted to turn her white savior solo tour of Africa into her own runway show of colonialist couture. Jodphurs, safari-inspired jackets and dresses, and on Friday, the pièce de résistance, a friggin’ snow-white pith helmet, have all made appearances during Trump’s tour, raising eyebrows while subtly undermining her supposed humanitarian efforts. All of these totems of western pop culture—Banana Republic’s “safari craze,” Ralph Lauren’s well-appointed tents, Peter Beard’s fashion shoots, Karen Blixen’s Out of Africa—are problematic because they exoticize and generalize the people and places surrounding their white subjects. Melania Trump walks with children as she visits the Nest Childrens Home Orphanage, which primarily cares for children who’s parents have been incarcerated, in Nairobi on October 5, 2018, during the third leg of a solo tour of Africa. Not that we’d really expect any better optics from the woman who infamously wore a jacket reading “I Really Don’t Care, Do You?” to meet refugees and stilettos to greet hurricane victims. What should she have worn, you ask? Maybe something that doesn’t remind us that she’d rather be gazing down at all of us from her gold-plated penthouse.